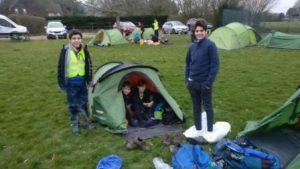 Over a weekend in March, four of our scouts hiked over 30km as a team, plotting their own route and hiking it quickly without getting lost. The weekend included setting up their own camp and doing their own catering as a team. This was done as a part of the Woking District Lightweight competition, around the Petersfield area. Below is a picture of them at camp in between the two days.